George Napoleon Landers was born on 14 July 1838, the fifth child and third son of James Landers and his wife Ann (nee Hadley). At the time of George’s birth, his parents lived at Croydon, where James was the licensee of ‘The Bush Tavern’ on Parramatta Road. George was baptized on 4 November 1838 by the Reverend George N Wood, in the parish of St James (Sydney). 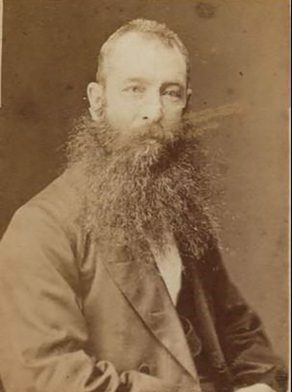 George’s father, James Landers (1806–84), was the Australian-born son of Frenchman Antoine L’Andre and Ann Poulter. Antoine L’Andre (anglicized later to Landers) was a French prisoner of war, who was sent to Australia by the British government in 1800 to establish a vineyard at Old Government House at Parramatta. George Napoleon was the first of four of James’s sons to be given second names from the times of the French Revolutionary and Napoleonic Wars, in which their grandfather Antoine had participated and been captured, and the Crimean War. In 1841, the Landers family moved to George Street West (Haymarket), where James Landers became licensee of the ‘Square and Compass’. In 1844, the family moved again, this time to Castlereagh. The stay in Castlereagh was short lived as in 1845 the family moved to St Marys (South Creek); George’s father was the publican at ‘The Oddfellows Inn’. George Napoleon Landers married Betsy, daughter of Isaac and Mary Whiley on 23 February 1864 at South Creek and had six sons and four daughters. He died on 3 July 1910. His wife died at Annandale on 25 May 1920, aged 76, and they were buried at the Old Church of England Cemetery at Rookwood. In 1887, when his father-in-law’s will was made out, George Landers was described as a ‘railway clerk’. The Sands Directory for 1890 shows George Landers as the Chief Clerk to the Engineer for Existing Lines of Railways and Tramways. By 1887, George and Betsy had established the family home at 54 McArthur Street Sydney and it was here that they lived for most of their married life; by 1905 they were living at 55 Annandale Street, Annandale. At the time of his death on 3 July 1910, aged 73, he is shown as a retired civil servant / pensioner, residing at 55 Annandale Street, Annandale. Landers was Alderman for Denison Ward, 1 December 1891 to 6 December 1900. He was a member of the Fishmarket Inquiry in 1896 and the Finance Committee, 1899-1900. In 1907, Landers was Alderman of Annandale Council. Information on George Napoleon Landers family courtesy Ken Heldon.